The history of alcohol in both America and Canada has by now a considerable literature. It deals with technological, business, consumer, temperance/Prohibition, and sociological aspects. What of the social life of the saloon: quirks of customers, brands of beverages, that kind of thing? There is of course the anti-saloon tract, which forms part of anti-drink literature. Lurid essays are not lacking, generally by ex-drinkers or ex-saloonkeepers, that chronicle the evils of liquor. Far from me to put them down, as the saloon did its share of wrong certainly. Still, it provided a service that people wanted and will find one way or another, today no less than earlier, and as American National Prohibition (1919-1933) showed too clearly. What of “happy days” in the old bar? Did they exist? Is there a balanced study of the old saloon? Christine Sismondo’s fine study, America Walks Into A Bar, certainly supplies a want here. But in general from what I can tell, period testimony on the benefits of the saloon is rare due to the social opprobrium attached to liquor-selling by the later 1800s. To write a happy account of running or patronising a bar in this period would have offended established authority. One example of a benign or even sympathetic look at the old bar was written in July, 1932 by Walter Brown Leonard. Prohibition would end soon. The newspapers, including the Republican-Journal of Ogdensburg, NY which published the article, felt encouraged to portray the bar’s positive attributes. While written in 1932 the article describes a much earlier period, the 1870s. Leonard was born in 1860 and as a boy had helped his father run the family’s bar and hotel in Morley, NY. So he described bar life from the inside so to speak. By the 1930s Walter Leonard was a sometimes journalist and music teacher, but had enjoyed a colourful career in a different field, show business. The piece is full of human interest and describes with colour various personalities. The most vivid is an old man for whom parting with a bank note, the old “shinplasters”, took an effort of will. He never bought a drink for others, and would occasionally stiff the tavern when claiming to have forgotten his money, omissions Leonard said were never repaired. The pub must have indulged him as a regular. Another colourful story: two “sons of Erin” would come in once a week, get drunk, fight good-naturedly (I guess that’s possible) and then walk home tipsily singing Irish songs. Leonard wrote that he never saw a youth take alcohol, only lemonade. He also never saw a woman drink in the bar, or act drunk in the town. Overall the image is of a business sanely run that supplied a social need, was approved in the community, and a part of daily life. On the drinks side, a few details are of interest: beer was dispensed by a “silver tap” from the end of the bar. Customers would serve themselves if they walked in and no one was there. A cask of bock beer was brought in in the spring. Lager beer was a new concept when Leonard was helping in the bar. He says old-timers stuck to their “ale” and “beer” (the latter probably was porter). Initially lager was only drunk by a younger set but gradually caught on. Whiskey was served by the drink, and Leonard says bottle sales were not allowed, they were the preserve of the pharmacy. But he implies bottles sometimes were supplied to customers, perhaps because the village was so small. The nearest town of any size, Canton, was a few miles away. Morley was a hamlet on a small river in St. Lawrence County, NY, just the other side from Canada (which never figures in his account). There is a good nugget in the piece which shows the genesis of Leonard’s long career in show business. After some training, he went on the road in his teens as an actor and musician. He “trouped”, and appeared in vaudeville and circus shows. He was an acknowledged authority on minstrelsy. In later days he wrote and produced shows and was a stringer for Billboard magazine and the North Country press in New York State. One account states of him that his work brought him everywhere in the United States but omits any reference to Canada, except for British Columbia. Having grown up more or less a stone’s throw from Canada, he seems to have never been to Ontario or Quebec. In those days, the two countries were more hermetic, which is odd since a good part of Ontario was founded by American Loyalists, but that’s another story. He had a long life, his life was filled with incidents of interest, he made it so. 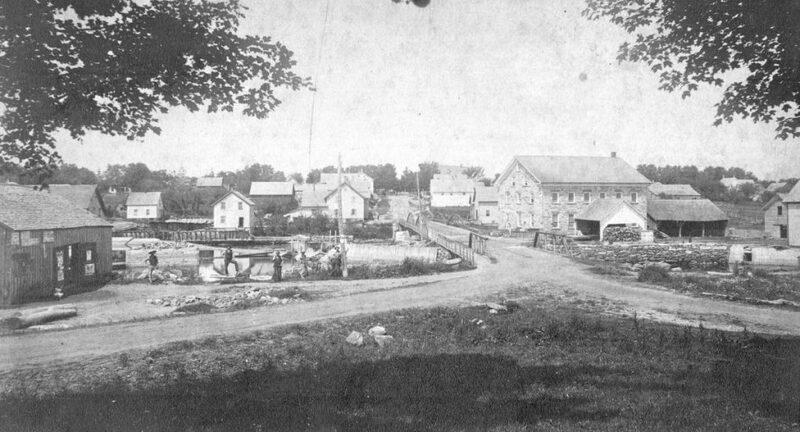 Note re images: the image of Morley, NY was obtained from this Canton, NY library source. (Almost certainly, one of the buildings shown contained Leonard’s Tavern and Hotel). Image is believed available for educational and historical purposes. All feedback welcomed. See Part II of this article, here.